While most of the items you store will stay safe in a traditional storage units, there are certain items that need special care in storage. Using a climate controlled storage unit can protect the items that mean the most to you. A climate controlled storage unit keeps temperature levels between 55°-78° F. By industry standards, this range is best for keeping you items safe from damage. Climate control storage keeps your items free from pests, dirt, and humidity. If you need a storage unit for a long time, you may want to consider a climate controlled storage unit. This is especially true if you are renting storage in an area with extreme seasons. Looking for a place to store your delicate items? Turn to Storage World. 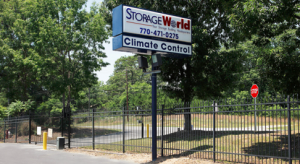 We offer climate controlled units near Atlanta at all our storage facilities. Looking for a climate controlled storage unit near you? Storage World has convenient storage units in Jonesboro, GA and Decatur, GA on Flat Shoals Pkwy and Panthersville Rd! Reserve a climate controlled storage unit today!